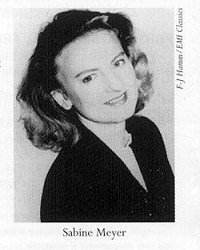 My first impression of Sabine Meyer's playing [she made the news when Karajan chose her, a woman (! ), for the BPO] was that it was faultless, yet rather chaste and perhaps slightly too controlled. Maybe her severe hairstyle and slightly matronly attire influenced me unduly? There was no hint of flamboyance; but then, does Brahms' E flat Clarinet Sonata really call for it? Of the composer's two Op 120 late Sonatas, it is the more direct and classical, the more poised and sanguine. Though highly lyrical it is contained, and though it shows off the full range of the instrument magnificently it avoids extremes of mood or colour. What Meyer delivered instead was a meltingly beautiful, subtly expressive tone without a hint of reediness, and a honeyed legato in sustained passages indicative of an iron diaphragm. If this work showed the politer side of her playing, Berg's expressionistic Four Pieces revealed a different aspect. Meyer introduced an appropriate note of rawness here, with blatantly reedy low notes and shrieking fortissimo high ones, and she relished the fluttertonguing in No 3. Her partner Lars Vogt, while never obscuring the clarinet, let rip in No 4. On his own in Berg's single-movement Piano Sonata (1908 - an amazingly advanced Op 1) Vogt produced a rather brittle tone, but this highly romantic work, which transforms a few motivic units, and 'recapitulates on a miniature scale principal features of Schoenberg's more advanced tonal works' (New Grove), also displays strong Wagnerian and Chopinesque undertones, and certainly came across powerfully. Equally romantic, Brahms's passionately rhetorical F minor Clarinet Sonata embraces the whole gamut of emotion from resignation and tender melancholy to bustling exuberance. Meyer's dynamic shading was superb in the meditative Andante un poco adagio, with a hushed first subject rising to a powerful climax before the recapitulation. Her wistful lyricism in the Allegretto grazioso became bubbling and carefree, with beautifully articulated staccato quavers, in the finale. Vogt partnered her with much sensitivity in a very equal relationship. One was left wanting more, and a welcome, if modest, encore was offered in the form of Brahms's Vergebliches Ständchen. The fact is, the composer's First Clarinet Sonata - his penultimate chamber work - is a hard act to follow, as indeed was Sabine Meyer's performance.